Joyce Laboso beat Julius Kones in Bomet , waiting to face Isaac Ruto. - Bana Kenya News, Real African Network Tubanane. Home News Joyce Laboso beat Julius Kones in Bomet , waiting to face Isaac Ruto. Joyce Laboso beat Julius Kones in Bomet , waiting to face Isaac Ruto. The deputy speaker Joyce Laboso won the Bomet county jubilee party ticket to unseat Governor Isaac Ruto on the August polls. After a final tally, Dr Laboso garnered 115,289 votes to beat her closest rival, Dr Julius Kones who got 72,546 votes. 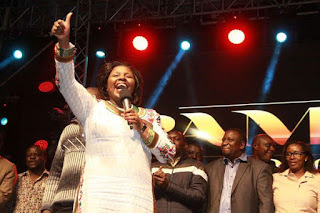 Joyce Laboso will face Bomet governor Isaac Ruto in the coming polls. The governor will be contesting the polls using the Chama Cha Mashinani (CCM) which is a co-party in the NASA coalition. In the third place is Stephen Mutai who got 8,895 votes. The results were announced by the Jubilee Party National Elections Board on Tuesday afternoon. The opponent Julius Kones disregarded the nomination votes as he claimed Laboso used the state machinery to win the elections. The party also is allegedly lean towards Laboso even during campaigns.